So I have a question and maybe a gripe. So the Anton Paar Snap 50 is not TTB approved yet their specs meet all TTB requirements. Is the only reason it’s not approved is they’re trying to protect their revenue from the DMA 5000 that just happens to be $27,000!!!!!! is it just that they haven’t submitted the SNAP50 for approval? Snap 50 is also not precise enough. The snap 50 is .1 v/v%, they told me it needs to be .01 v/v%, though I think it would only need to be .05 v/v. 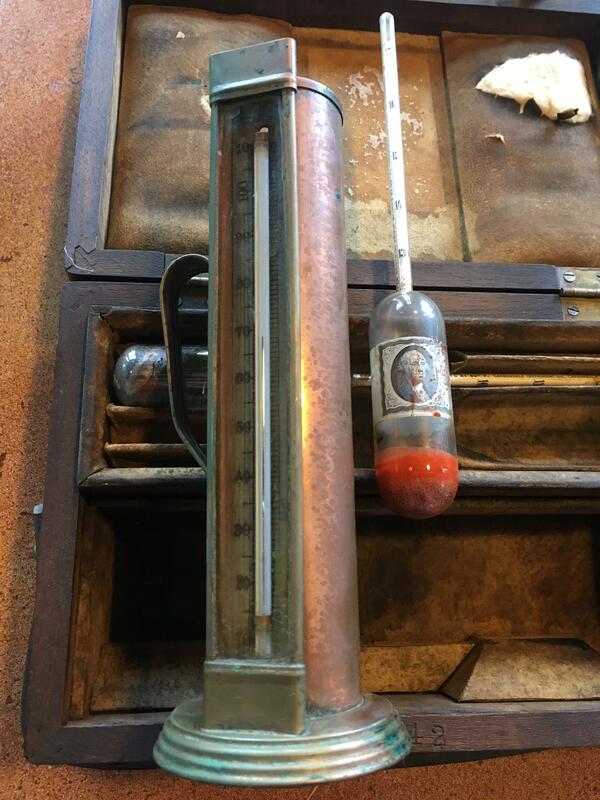 Nothing cheap and easy, cough up money or use a hydrometer and thermometer. The Snap 50 has been succeeded by the Snap 51, however accuracy and repeatabillity haven't changed AFAIK. Same scenario with the Edrometer. Bloody good price though. Rudolph makes a desktop version thats TTB approved and much more affordable than the Anton Paar. Iv had better customer experience with them as well. Snap 50 is great for taking quick measurements to gauge and cut to proof, but for final proof check a hydrometer and thermometer is the way to go. We use the Anton Pat devices for all our runs in the uk. If your worried about how accurate it is, you can always cross reference it with a known good sample and your hydrometers to be sure they all tie up. Sorry, not true for the TTB in USA. You can only use one of the TTB approved electronic density meters for final gauging, or use calibrated and certified floating hygrometers with the TTB described method. I guess one could use an unapproved brand of meter if it was calibrated and certified for high enough accuracy. That accuracy has to include both for density measurement and either temperature control (TTB preferred) or temperature measured and corrected. Often what limits some of the cheaper models is the temperature control or compensation. But if you go rogue, you can always be at risk. Actually, the accuracy of the eDrometer is not as good as you might think. The latest version is 0.001 SG. But the range of SG for spirits is from 0.787 to 1.0, or about 0.2, so a variation in SG of 0.001 could be a variation in proof of 1, or a variation in ABV of 0.5. Because the range you have to meet is +0.3 to -0.0, you need at least 0.05 to achieve that, but the TTB looks for 0.01. For comparison, the current Anton Parr SNAP 51 does 0.1. Their "hobbyist" EasyDens does 0.5 which I think is comparable to the eDrometer. To be fair the devices we use calibrate the reading back to 20 degrees/c and in comparison with lab samples we use for checking the instrument they are much more accurate than the hyrdrometes for proofing Spirits. In the uk we are allowed plus or minus 0.3 percent but with the density meters we are within 0.1 percent. But in the end it depends what you are allowed to use. As long as it’s calibrated and meets the regs it shouldn’t matter aside from how easy it is to get the measurement up you need. My preference is to have both so that you can always check/verify what we are doing. Again, so no one is confused, UK and USA rules might be completely different, and we have to use USA in USA. But you can not make any of the cheap density meters meet the requirements by doing more calibration. Calibration corrects systematic errors, it does not improve accuracy. The accuracy is what the manufacturer says it is. 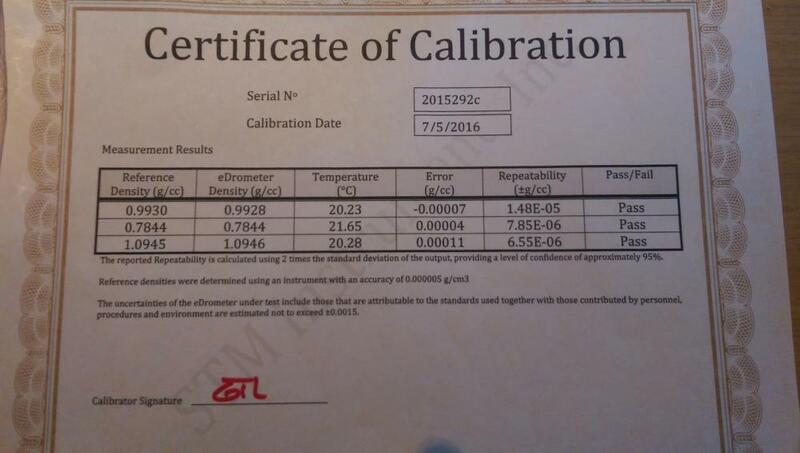 The requirement for the TTB is 0.01 % ABV in order to assure the product is in the range of -0.00 and +0.30 of required proof. Sure, you could in principle get by with less accuracy, but the TTB will not consider it an approved method. For sure, if you used a device that has an accuracy of 0.1%, even if you recalibrate it, you will not have the required accuracy for the TTB. Anyone able to get a 0.01% accuracy reading their hydrometers? And your simultaneous thermometer reading? just asking because these ttb rules are ridiculous. YOU'RE NOT THE BOSS OF ME. oh wait, you are. Anyone able to get a 0.01% accuracy reading their hydrometers? Im assuming that was a rhetorical question! Ah, how do you get comparable accuracies from analog versus digital readings? Okay, how it works: the assumption is that the digital meter is doing all the correction, interpolation, and averaging FOR you, so that is built into it already. So when you have a 0.01% accurate reading with a 0.01% repeatability, the assumption is that the actual reading could be off by 0.04%. BUT, if you are doing the analog measurement with the IRS hydrometers, they have 0.2 proof (0.1%) divisions. Gee, that is worse, isn't it? Well, the assumption is that you can interpolate more accurately than a division, at least 1/2 of a division, which would be 0.05%, and if you average 3 repeated measurements, you might improve to as much as 0.025%. But then you have to also factor in the accuracy of the analog temperature reading and correction of proof, which might bring you back to about 0.04%. 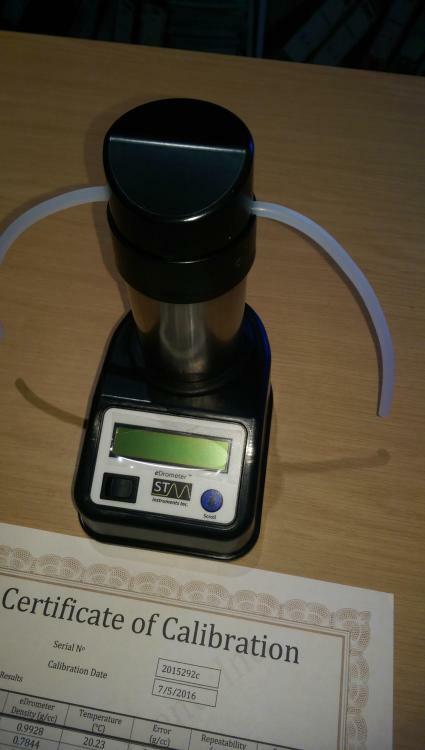 So, that is how a 0.1% division glass hydrometer is considered equivalent to a 0.01% accurate digital meter. At first blush, it doesn't seem possible, but in fact it is, if you are skilled with hydrometers and thermometers (in the way of the old chemists). Admittedly, many of us might not be able to read and correct the analog tools to do any better than a Snap 50! In my opinion, the traditional and approved way of measuring proof is a bit of the Heisenberg uncertainty principle. You can either know the temperature or the proof/density, but not both. I’d bet that on average, any of the digital readers yield better results than the average person using the best analog equipment. I wish the TTB would acknowledge that. So I have this piece of history which apparently at one time was good enough. Digital devices should be good enough too.